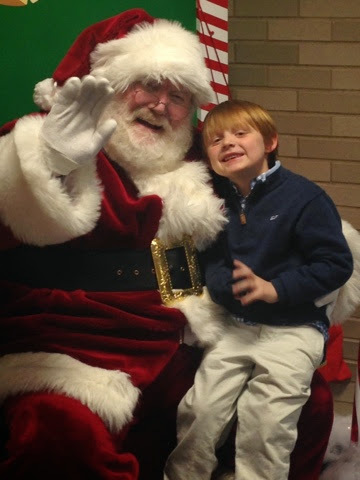 Ingram the Conqueror: December 2014 Part 2...The North Pole! December 2014 Part 2...The North Pole! As if race weekend wasn't enough fun, Ingram and the girls got to go to the North Pole to see Santa!!! Okay, so they didn't really go to the North Pole, but the wonderful folks at Delta Airlines sure made it possible for Ingram to believe he was going there! 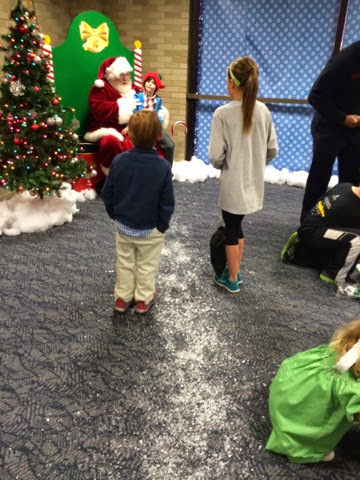 We checked the kids out of school a little early so that we could get to the airport in time to check in for our Fantasy Flight to the North Pole with a ton of other St. Jude and Lebonheur patients and families. 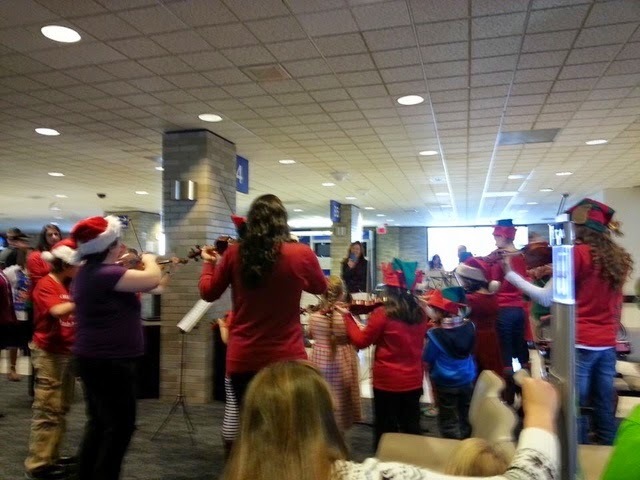 There was a group playing Christmas carols on violins, a lot of therapy dogs from SJ and Lebonheur, the Riverkings Turtle, the Child Fil A cow, and the University of Memphis Tiger that entertained us while we waited to board our plane. 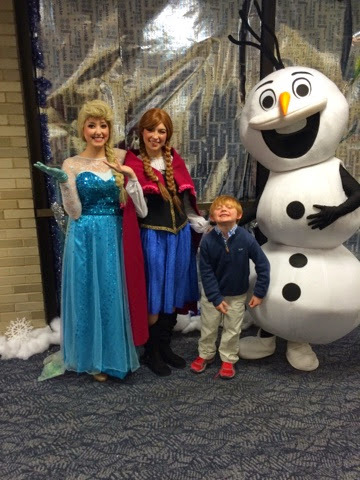 We took off aboard the Memphis Grizzlies private plane and wound up at the North Pole with Santa and his Elves, and Elsa, Anna, and Olaf from Frozen too. 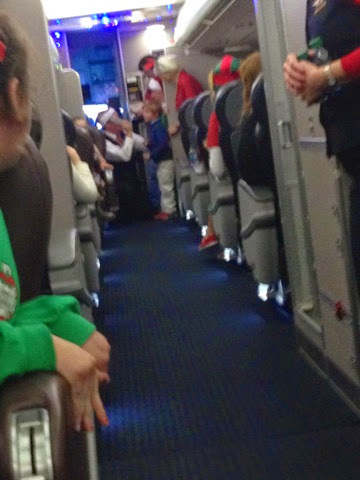 The Memphis Fire Fighters and the Delta Airline employees were also there. 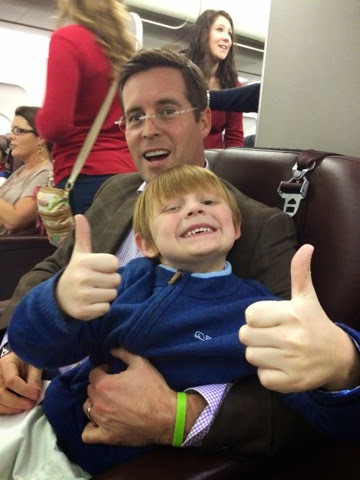 While we were on the plane, there was lots of singing and dancing and Ingram got to tell what he wanted for Christmas over the loudspeaker on the plane. "Let It Go" was sung by all and Ingram immediately plugged his ears while Lindsey refused to sing even though she sang it for the rest of the night!! 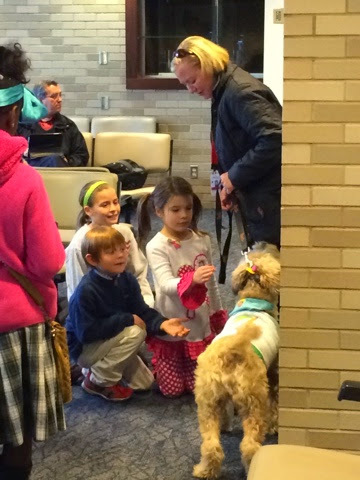 We had a great time meeting new friends and seeing old ones. The only thing missing was Madison, but she was at home sick. 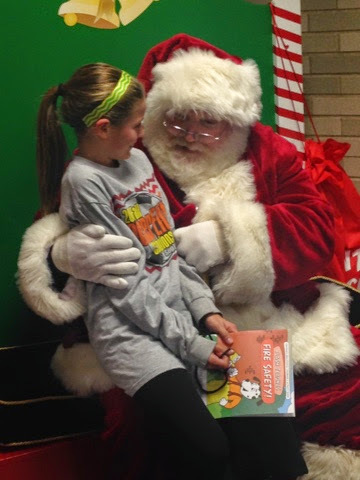 Now if we could just figure out what Ingram told Santa that he wanted for Christmas! This Group Played Christmas Carols For About 30 Minutes For All The Kids And Adults! 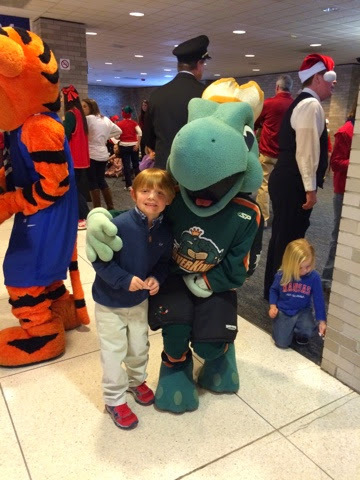 Ingram And The RiverKings' Turtle! 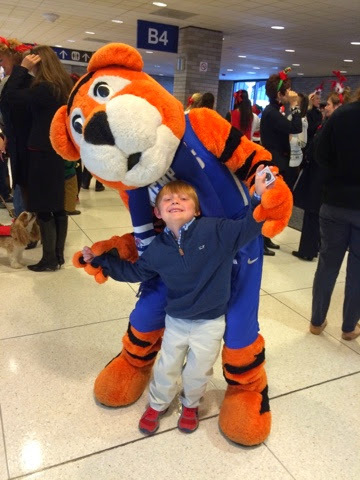 Ingram And The University Of Memphis Tiger! 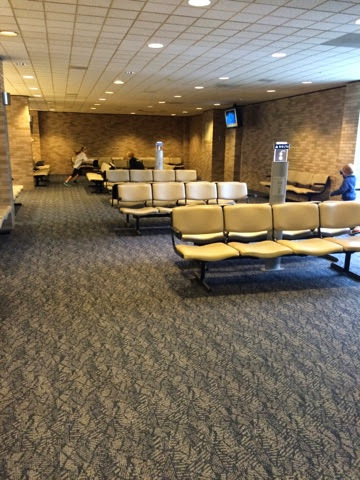 Playing Tag In A Completely Empty Gate In The Terminal With The Ellsworth Crew! 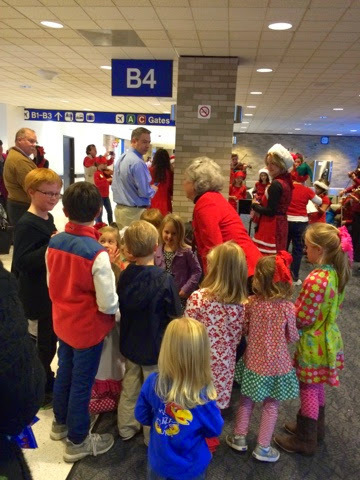 The Sweetest Lady Was Getting Some Of The Kids Excited To See Santa! Seriously...How Tiny Does Ingram Look In That Chair?? "Noooooo...Not Let It Go Again!" "My Name Is Keith And I Want An Xbox And Pokemon Cards For Christmas!" Ingram Was Asked To Say His First Name And To Tell Everyone What He Wanted For Christmas. 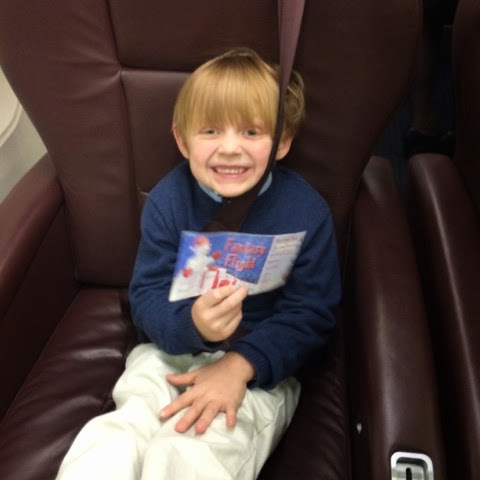 When He Got Back To His Seat, We Asked Why He Said Keith Instead Of Ingram. He Said "The Guy Told Me To Say My First Name And I Did." Apparently Ingram Knows How To Follow Directions; He Must Have Learned That From His Kindergarten Teachers! 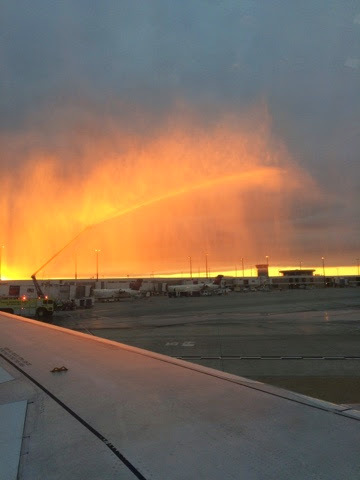 The Memphis Fire Department Trying To Make A Snowy Entrance For Our Plane With Their Water Hoses. It Wasn't Quite Cold Enough, But It Sure Was Pretty! The Big Man In Red! 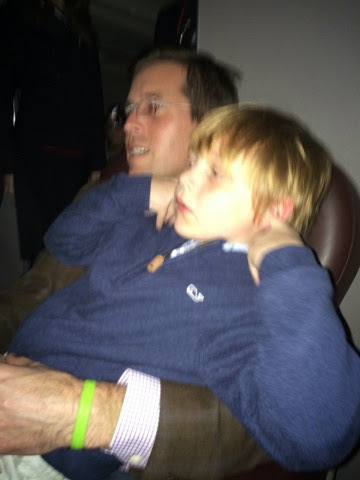 Both Ingram And Lindsey Were A Little Nervous Waiting To Talk To Santa! 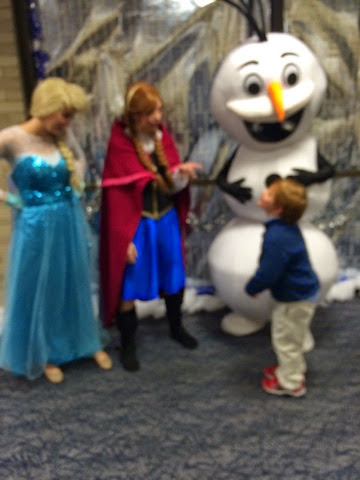 But Not To Elsa, Anna, And Olaf! Ingram Was Joking Around With Them The Whole Time! Putting The Ingram Charm On! Now This Little Peanut Is Definitely Trying Not To Be Mischievous! Look At That Smile!! 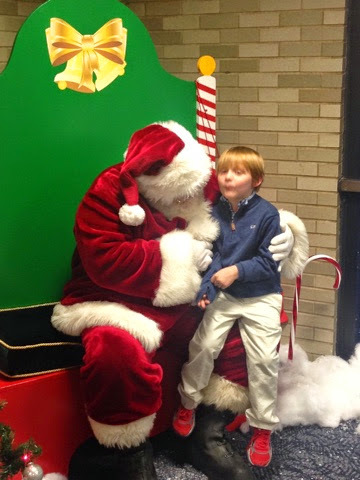 I Think This Is When Santa Asked Ingram If He'd Been Good This Year! Can You See Him Trying To Figure Out The Right Things To Say?? 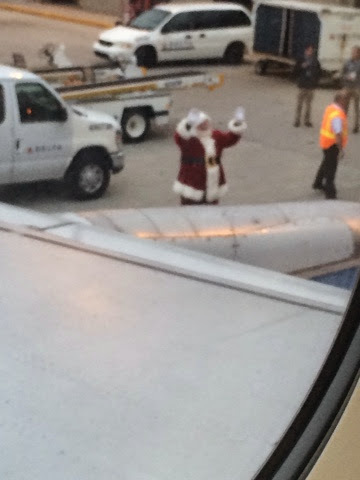 "Don't Worry...He's On The Nice List!" 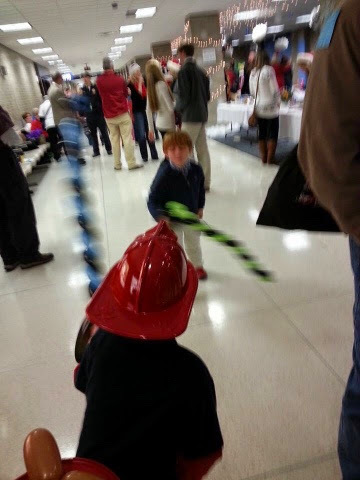 Ingram And Noah Battling It Out With Their Balloon Swords! December 2014 Part 1...The Race!